How far would you go to stay true to your beliefs? Would you risk spending years in prison? Being ostracized by your country? What about your life? Would your faith be so strong that you’d go into battle armed with nothing else than knowing that if you died, it would be with a clean conscience? How far would you go – really? If you’re the late Desmond T. Doss, your convictions as a Seventh-day Adventist are so strong that you’d rather get blown to bits by the Japanese while trying to save your fellow soldiers as a medic in World War II than touch a weapon, let alone fire one. Hacksaw Ridge tells the story of Doss – the only conscientious objector ever to be awarded a Medal of Honor – and quite possibly the greatest American war hero nobody talks about, maybe because there aren’t any words to truly define what he did during the Battle of Okinawa in World War II some seven decades ago. But while one of the bloodiest battles in American history has long been remembered for the lives it claimed – more than 110,000 Japanese and more than 50,000 for the Allies – Doss’ actions live on more than a decade after his death. 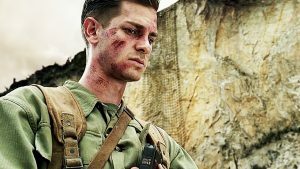 As an Army medic, Doss – played by Andrew Garfield in an Oscar-worthy performance – used his unyielding faith to miraculously dodge enemy fire while he stayed behind and rescued 75 wounded American soldiers left for dead after the Japanese forced the Allies to retreat down a 350-foot tall escarpment to the Pacific Ocean. “Please Lord, help me get one more,” Doss said out loud repeatedly during the 12 hours in which he provided the miracle of life to those who appeared destined for death. Directed by controversial director Mel Gibson, Hacksaw Ridge is as complex as Doss’ pacifist views are simple. It’s a war movie and an anti-war movie, as Doss’ internal battle to go to war armed only with his beliefs is in direct conflict with his band of brothers, led by Sgt. Howell (Vince Vaughn), whose mix of witty humor and cruel treatment of Doss will have the audience laughing one minute and cringing the next. 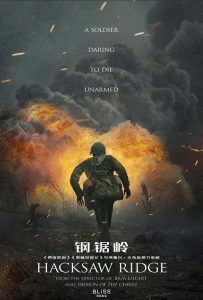 Doss’ willingness to enlist but refusal to kill spars with the movie’s themes of courage, patriotism and military might, yet Gibson weaves these contrasting storylines to paint a picture that can be interpreted differently. Vince Vaughn is on target as Sgt. Howell in Hacksaw Ridge. Was Doss trying to be a martyr or is it really possible for someone to be so steadfast in his or her beliefs that they’ll risk everything just to die knowing they did the right thing, even if society thinks it’s wrong? Writers Andrew Knight and Robert Schenkkan slowly get the audience to fall in love with Doss, who as a child growing up in the foothills of Virginia’s Blue Ridge Mountains forgoes all violence after nearly killing his older brother in a fist fight and pulling a gun on his alcoholic and wife-beating father, Tom (Hugo Weaving), who is still reeling from seeing his friends die while they fought together in World War I.
Desmond Doss’ refusal to touch a gun seems contradictory, considering he volunteers to fight in World War II, yet refuses to fire a shot, even at the gun range. His unit ridicules and hates him and the Army wants nothing to do with him. The military would rather Doss go to jail than war. Desmond Doss, an Army medic in World War II, is the only conscientious objector ever to be awarded a Medal of Honor. Ultimately, Doss becomes a medic and the next thing he knows, bullets fly, rocket-propelled grenades explode and men fall like dominoes. 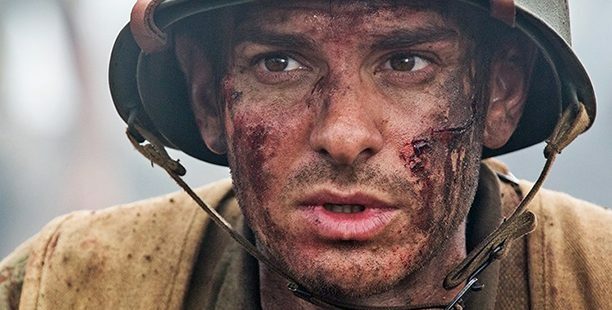 The battlefield has always had a sacred place in Hollywood, as Platoon, We Were Soldiers, American Sniper, and Fury have all had shown the extremely graphic and unrelenting violence of the carnage of war, but none does it quite like Hacksaw Ridge. The film’s cinematography makes the audience feel they are at the Americans’ side as soldiers duck behind tree stumps and jump into foxholes to avoid death. Spectators also see through the eyes of the Japanese as they scurry through their underground tunnels to stay clear of artillery fire. If there’s one weakness in Hacksaw Ridge, it’s that it doesn’t spend enough time developing Doss’ story outside of the battlefield, specifically with Dorothy Schutte (Teresa Palmer), the nurse Doss dates and eventually marries. Though the film is two hours and 11 minutes, it also could have spent more time on Doss’ relationship with his older brother, Harold (Nathaniel Buzolic), who enlists a few years before Desmond. 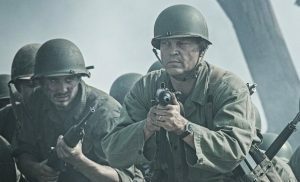 But those shortcomings are overshadowed by the Hacksaw Ridge’s overall brilliance, as its battle scenes set the cinematic standard – even eclipsing the opening scene of Saving Private Ryan, which had long been the benchmark. There’s no question what Doss did was heroic, but is society ready to embrace a movie about another conflicted soldier? It worked for 2014’s American Sniper, a biopic about U.S. Seal Chris Kyle (Bradley Cooper), the most lethal sniper in American history who was murdered by a fellow soldier upon returning home from serving in the Middle East. Director Clint Eastwood’s film with a $59 million budget generated more than $547 million at the worldwide box office en route to being nominated for six Oscars. Hacksaw Ridge’s budget was $53 million. But Hacksaw Ridge isn’t about killing; it’s about living. Doss’ tale in which he persevered through retaliation, ridicule and criminal charges to drag dozen of Americans to safety through a sea of blood and mutilated bodies and whizzing bullets, deserves more than just respect. It’s worthy of your time and the cost of admission.